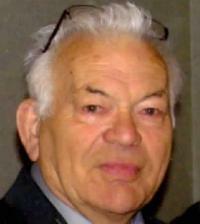 The family of Claude Dupont of St. Albert is saddened to announce his sudden passing on Wednesday, March 11, 2015 at the age of 85 years. He is survived by his loving spouse of 60 years, Leona; daughters: Francoise (Doug) and Catherine (Larry); grandchildren: Veronica (Irfan), and Shaun; great grandson; as well as numerous relatives and friends. Claude and Leona married in 1955 and shortly thereafter emigrated from France for the adventure of their lives. A Mass of Christian Burial will be held at 11:00 a.m., on Monday, March 16, 2015 at St. Albert Catholic Parish, 7 St. Vital Avenue, St. Albert, Alberta with interment to follow at Holy Cross Cemetery, 14611 Mark Messier Trail, Edmonton, Alberta. Memorial donations in Claude’s name may be made to A Charity of One’s Choice.